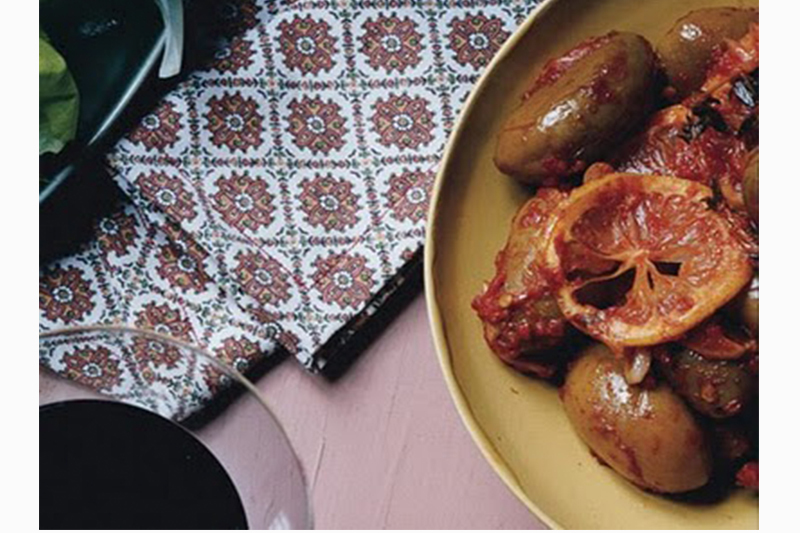 An easy marinade of garlic, lemon, thyme, and a dollop of the North African hot sauce harissa make these green olives memorable. They improve with age. Cover olives with water in a small saucepan and bring to a boil, then drain. Cook garlic in oil in a 10-inch heavy skillet over medium heat until garlic is golden, about 2 minutes. Add tomato paste and cook, stirring, 1 minute. Stir in water, harissa, thyme, and olives and simmer briskly, stirring occasionally, until liquid is thickened and coats olives, about 5 minutes. Remove from heat and stir in lemon slices. Transfer to a shallow dish and marinate, chilled, at least 24 hours.